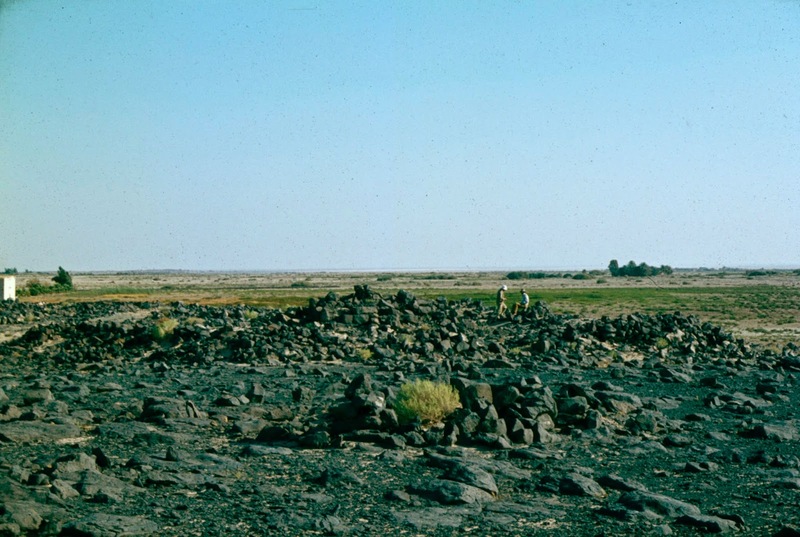 In c. 1981 David Kennedy visited Qasr Ain el-Beidha as part of his investigations into the archaeological traces of the Roman frontier in North-East Jordan. 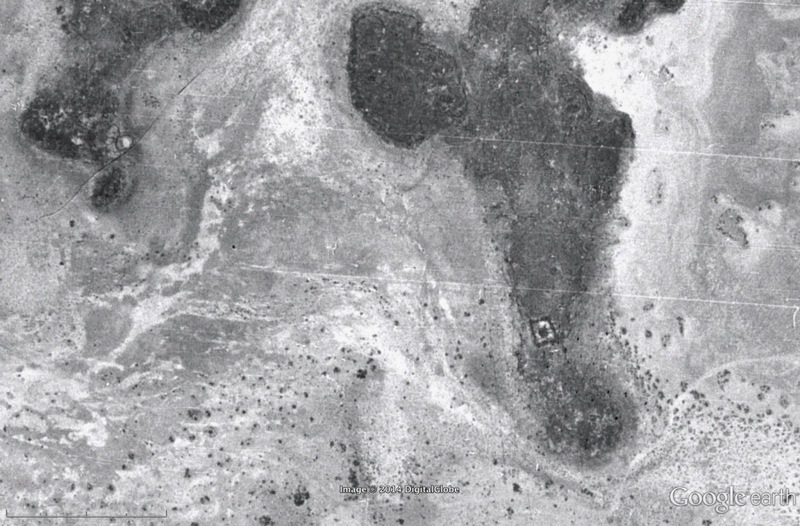 The site shows clearly on the Hunting Aerial Survey imagery of 1953 - a clear perimeter wall c.20m square with a collapsed square tower in the center. HAS 11.008 overlaid in Google Earth - Qasr Ain el-Beidha is clearly visible on the basalt bottom right. Please click to enlarge image. It consists of a tower, 5.14m square, set within a walled enclosure 21 x 16.18m with, apparently, rounded corners. The tower is built of large blocks of basalt laid in regular courses, 3 of which may be seen and two others inferred. The surviving height of the 3 courses is 1.12m and the wall is 1.2m thick made up of blocks laid as headers and stretchers. Both tower and enclosure wall are much decayed and overlaid with rubble. The latter seems to have been no more than dry-stone built wall and there was only one point, on the S. side, at which evidence of the rough slabs being laid in courses was clear (Kennedy 1982 Archaeological Explorations on the Roman Frontier in North-East Jordan: 186-7). Qasr Ain el-Beidha general view c. 1981. Image © David Kennedy. Please click to enlarge image. In addition, Kennedy notes the lines of site from the tower to Qasr Azraq and Qazr Aseikhim, major Roman sites in the area. 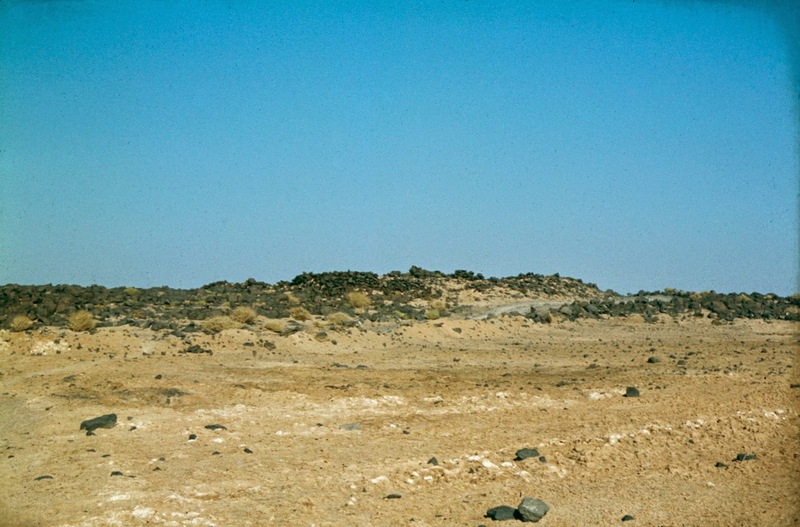 He concludes that the site likely acted as "an outpost to control access to a water-point" as well as a watch-tower on the route to Qasr Burqu (Kennedy 1982: 187). Qasr Ain el Beidha photographed in 2011 - the perimeter wall can just be seen to the left of the road in the picture. 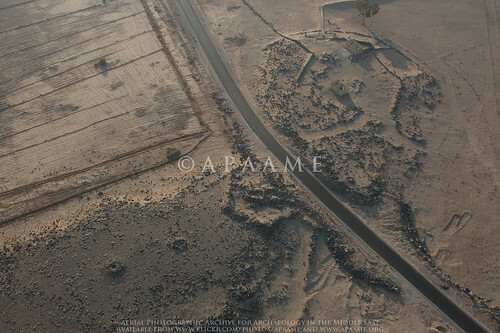 APAAME_20111027_MND-0079. Please click to enlarge image. Today, the site is lost except for a section of the perimeter wall. We were able to photograph what remains of the site in 2011. A bitumen road has been built since 1978 running east from Azraq straight through the site. Historical satellite imagery in Google Earth implies the road has been in existence since at least 2003. Photographs from the 1978 survey imply that the track had previously gone around the site. Qasr Ain el Beidha general view c. 1981. The track can be seen running around to the right of the site in the photograph. Image © David Kennedy. Please click to enlarge image.